As a hiring manager, it’s important you stay up to date on accounting and finance employment trends. Understanding which positions and skills are in demand is key to attracting the most qualified candidates. 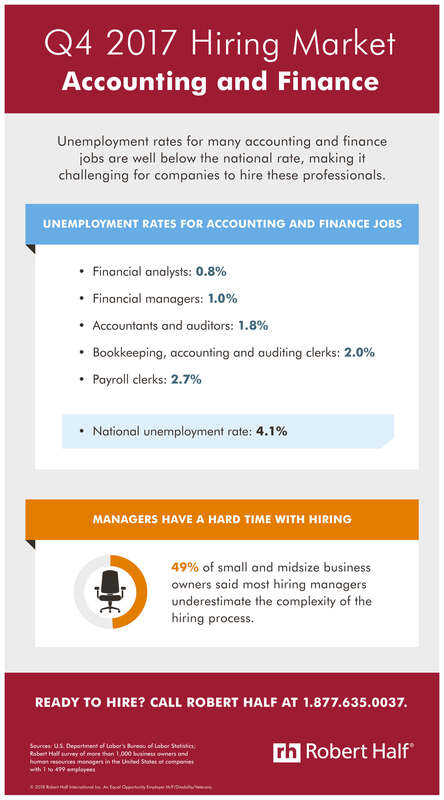 Companies looking to hire highly skilled accounting and finance professionals continue to face a shortage of job candidates. As a result, competition for top talent can be fierce. Many employers are increasing salaries and bonuses, and offering more robust work-life balance options, to attract top talent. Each quarter, we also look at current employment trends on our blog, and we break down the numbers so you know what they mean for your business. In these pieces, you’ll find analyses of the latest labor market data, as well as insight and advice you can use to improve your hiring efforts.